One of the greatest developments in horticulture and agriculture was the realization that crops need to be rotated for the maximisation of production and the minimisation of disease. This understanding was at the heart of Britain's agricultural revolution in the eighteenth century, which prepared the ground for the industrial revolution to really take off, as it enabled food to be produced for the growing urban working class. Originally the British model used a fourfold rotation, but rotations have now become more sophisticated and complex. The greatest agricultural disaster to hit the British Isles was the potato famine. Note that I do not call it the Irish potato famine, as it hit elsewhere than Ireland, but Ireland was the place that suffered the most. We say that the cause was Phytopthera infestans, a horrid fungal disease, and this can strike anywhere, but what made it worse was that in Ireland the people were too desperate to rotate crops properly. The Irish were being made to grow the crops that were needed to pay rent and stay alive. Their corn went to pay rent, and they needed potatoes to sell to the mass English market. Thus they were forced to grow crops on the same land every year without rotation, and the potato variety that they grew was the lumper, which is seriously prone to blight. A double whammy! The problem is this. During any season soil will pick up some plant diseases. So when my potato bed picked up some blight two years ago [the first time that it has happened] I decided that after that I would grow leeks on it the next year. then it will be two or three years at least before I grow potatoes in that bed. Thus the fungus will die of starvation, as it has no host to infect. But the Irish could not do this, as they were forced to grow every year on soil where diseases were becoming well established. Eventually there came a year when weather conditions were right for blight. Disaster! I do not need to speak of the horrors that ensued, especially to those of you whose ancestors were driven from Ireland at that time. Not only does rotation prevent soil diseases accumulating, but it also balances the nutrient content of the soil. Individual vegetables take a specific cocktail of nutrients from the soil, and if you grow the same ones yearly you note that the specific nutrients diminish. Cotton is infamous for demanding overmuch from soil, which is why the sharecroppers of the American dustbowl, who were forced to grow cotton every year on the same land, soon became impoverished, as yields diminished [See Steinbeck's The Grapes of Wrath. ]Of course nutrients can be replaced by fertiliser, but this has its problems as well, and does not replace humus as manure and compost does. The traditional British rotation was four-fold in vegetable fields. The farm was divided into fields. When one was doing potatoes, another was for beans and peas. Another was for brassicas, and the final one for roots, such as onions and leeks. This proved a simple rotation, but it became more sophisticated with time, as other plant families were brought in and space was made in the plan for cereals. For gardeners a complex rotation is very necessary, as vegetable gardens grow a wide range of plant families. Furthermore there has to be room for including winter crops in the planning. The basic principle, though, is that members of one vegetable family are succeeded by members of another, so if you are planting winter crops to succeed summer ones, make sure that you plant a family in the bed previously occupied by another family. Some soils may exclude certain families, as may some latitudes. Where I am I can grow sweet corn, but not very well. So I have to choose my corn varieties carefully for colder latitudes and a damper climate. On my ground carrots for some reason do not do well, so I have had to grow them successfully in raised beds on imported compost. Please note, some families have had their names changed over time. Solanaceae: Potatoes, tomatoes, aubergines: Need lots of manure, and potatoes like some lime. Legumes: Peas and beans: Are known for adding nitrogen to the soil, so many growers like to grow tham on ground where next year salad crops will be. Graminaceae: Sweet corn.Cereal crops tend to be in the maize family with sweet corn. Fresca: strawberries. Fresca is a single genus rather than a whole family. Herbs have their own rotation. There are five herb families, but three are mentioned above. These are Brassiceae [e.g. horse radish] , Umbelliferaceae [e.g parsley] and Alliaceae [e.g. chives] But we also have the Labiatae, the mint family. Those of you who dwell in very warm climates can add Zingiberaceae, the ginger family. There is no point in my trying to grow this family, as it needs climatic conditions far warmer than we find in the United Kingdom. Apparently Umbellifers can be grown for two years in succession on the same ground, but I do not do this. Furthermore, the same applies to beans, which can grow well in the same ground for a while. But I take no risks with rotation. Not everyone uses rotation as strictly as organic gardeners do. Permaculturalists are committed to mixed planting in which all plants are intermingled. The advantage of this is that it imitates the way in which plants grow in the wild. 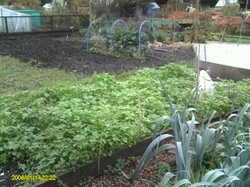 Another advantage is that it prevents diseases building up and spreading through one bed. The disadvantage is that this technique is in human energy and planning terms quite demanding and takes much management. There is also companion planting, in which plants are grown together if they get on with each other. A classic example is carrots, that grow happily with marigolds, whose scent deters carrot root fly. 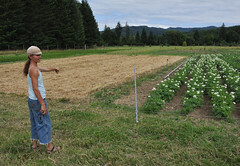 A major form of companion planting is the Native American technique of the three sisters bed. In this pumpkins, corn and beans are grown together, as these three make maximum effective use of the ground. The corn provides support for the beans, which occupy the higher zone, whereas the pumpkins, or other cucurbits such as squash, cover the ground and prevent weeds spreading. Cereal farmers often have a more limited range of crops than organic gardeners, which is because they are governed by market demand. Often this means growing crops on the same ground or rotating more quickly than a gardener would. Many get round this by adding fertiliser, compost and manure to the soil to replace lost nutrients, but they still cannot get round the tendency of plant diseases to accumulate. There is also the problem of pests building up in one area where a plant family has been grown for too long. GM crops desisgned for herbicides can overcome this problem for a while, but evolution overtakes the herbicides and the GM. We are now getting super weeds and super pests resistant to the poisons that killed their kin. Already in southern England The glasshouse white fly has become immune to insecticides which killed off many of their species in glasshouses, leaving only the naturally resistant to survive and breed. Ultimately rotation is a useful and practical technique for growing crops that can be used by farmers and gardeners alike. Thank you Frank, that's really interesting and useful. This is excellent advice. Your farming articles would probably make an excellent book, if you compiled them all.